We are very excited to announce that this summer, Camp Pioneer will once again be offering an off-property kayak float trip down the Lower Mountain Fork River! New for 2017: Leader’s Only Kayak Adventure. 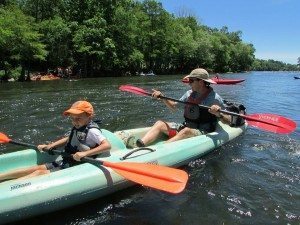 Reserved for Scouts who are aged 13 or older by June 1, of the current year, this exciting trek will involve an approximately 3.5 hour float down the Mountain Fork river below Broken Bow Lake by single-person kayaks. Scouts will leave from Camp Pioneer and travel approximately an hour by vehicle to the River, where they will receive basic instruction in river safety and kayaking technique. From there, they will travel a few miles upriver with one of our outfitters, and float back down to the departure point. 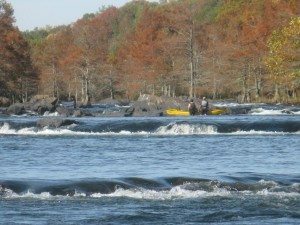 The float trip will include some exciting sections of the river, including some minor rapids. Prior kayaking experience is a definite bonus, but is not required. Participants must be able to demonstrate that they can safely control their boat before they will be able to leave from the outfitter for the river. Kayaking merit badge is not required, but is strongly recommended. Age 13 by June 1 of then-current year. Adult participants MUST have completed BSA Safety Afloat and Safe Swim Defense training. Final approval by Camp Aquatics director of suitability for participation. All participants must have signed waiver(s) of liability as required by Camp Pioneer and our Outfitter. Youth participants’ waivers must be signed by their parent or legal guardian. Scoutmaster only signatures are not acceptable. Individual trips may be cancelled or shortened due to weather and/or river conditions that make completing the trip unsafe or inadvisable in the opinion of the Camp Director, his/her designee, or our outfitter.